Posterior tibial tendon dysfunction (PTTD) is an overstretching of the posterior tibial tendon in the foot which generally occurs after long term overuse related inflammation and degeneration of the tendon (Posterior Tibial Tendonitis/tendonosis). Tibialis posterior muscle/tendon has a major role in supporting the medial arch of the foot and therefore its dysfunction can lead to flattening of the feet (over pronation) in adults. Is it for this reason that PTTD is often called adult aquired flatfoot. The posterior tibial tendon is a fibrous cord that extends from a muscle in the leg. It descends the leg and runs along the inside of the ankle, down the side of the foot, and into the arch. This tendon serves as one of the major supporting structures of the foot and helps the foot to function while walking. 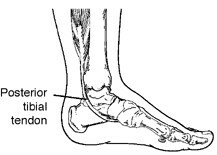 When there is post-tibial tendon disfunction, the tendon does not function to hold up the arch, resulting in flat feet. This can lead to heel pain, arch pain, plantar fasciitis &/or heel spurs. Post-Tib Tendon dysfunction occurs when the muscle is overused and the tendon that connects the muscle to your bone is strained and eventually weakens. Years of over-pronation (flat feet) can also lead to posterior tibial tendon dysfunction. If you keep overusing the muscle, damage to the tendon builds up and tendonitis develops. At first the pain or swelling may come and go quickly, but eventually the problem may become more permanent. The symptoms of PTTD may include pain, swelling, a flattening of the arch, and an inward rolling of the ankle. As the condition progresses, the symptoms will change and so will the treatment. Stage 1: When PTTD initially develops, typically there is pain on the inside of the foot and ankle (along the course of the tendon) accompanied by inflammation and swelling. Stage 2: Later, as the arch begins to visibly flatten, there may still be pain on the inside of the foot and ankle. But at this point, the foot and toes begin to turn outward and the ankle rolls inward. During stage 2, your foot should still be quite flexible and able to form an arch when non weight baring. -Stage 3: As PTTD becomes more advanced, the arch flattens even more and the pain often shifts to the outside of the foot, below the ankle. At this time the foot often becomes a rigid, non movable flat foot, At this point the tendon has deteriorated considerably and arthritis often develops in the foot. In more severe cases, arthritis may also develop in the ankle. - Orthotic devices, an Ankle-foot orthotic or a brace. To give your foot and arch the support it needs, your podiatrist may provide you with an ankle foot orthotic, a custom made foot orthotic that fits into the shoe or a specialised brace. - Immobilisation. Sometimes periods of rest are required and if needed a cast or Camwalker/ moon-boot is worn to immobilize the foot and allow the tendon to heal. You may also be advised to completely avoid all weight bearing for a while. - Physical therapy. Ultrasound therapy, heat therapy and strengthening exercises may help rehabilitate the tendon and muscle following immobilisation, These therapies will differ from case to case and therefore should only be prescribed by a professional such as a podiatrist or physio. - Medications. Nonsteroidal anti-inflammatory drugs (NSAIDs), such as ibuprofen, help reduce the pain and inflammation in some cases. - Shoe modifications or Support shoes, such as athletic foot wear (sneakers) or orthopedic shoes may be required. - RICER during periods where active inflammation is present, the RICER principal may be advised. During stage 1 of PTTD, the inflammation and tendon injury will generally respond to rest, ice, immobiisation and physical therapy. Once immobilised, a pair of custom made devices and appropriate shoe wear is generally required to help stabilise the tendon. In Stage 2 the addition of a foot braced is often required. If left untreated PTTD in the final stages of this condition, stage 3, can leave you with a both a visibly flat foot, as well as a permanent deformity. This deformity is not only accompanied by painful arthritis but it often places limitations on walking, running, or other activities and may require surgery. It is important to remember that every person and injury is different and thus treatments will differ from person to person. In cases of Posterior Tibial Tendon Dysfunction where conservative non-surgical treatments have failed, surgery may be required to reduce the pain in the area and promote mobility. Surgical treatment may include repairing the tendon, realigning the bones of the foot, or both. In these cases, it is advised that you speak with your surgeon in regards to the benefits vs the risks of such a surgery.